It is our 10 year anniversary! Can you believe it! Save the date, invite your friends, the car clubs, EVERYONE!!!!!!!!!!!!!!!!!!! This year, for our ten year anniversary, we are having a SUPERCAR CORRAL! WE have exotic car clubs from all over Socal and from out of state coming! This might just be one of the largest showing of exotics ever! This year our goal is to collect 60,000 toys for needy kids....a huge goal, we need your help more than ever. As most of you know, this is 100% Charity, all proceeds go to the kids. We are also a recognized Charitable Foundation 501(c)(3), your donations are deducible. 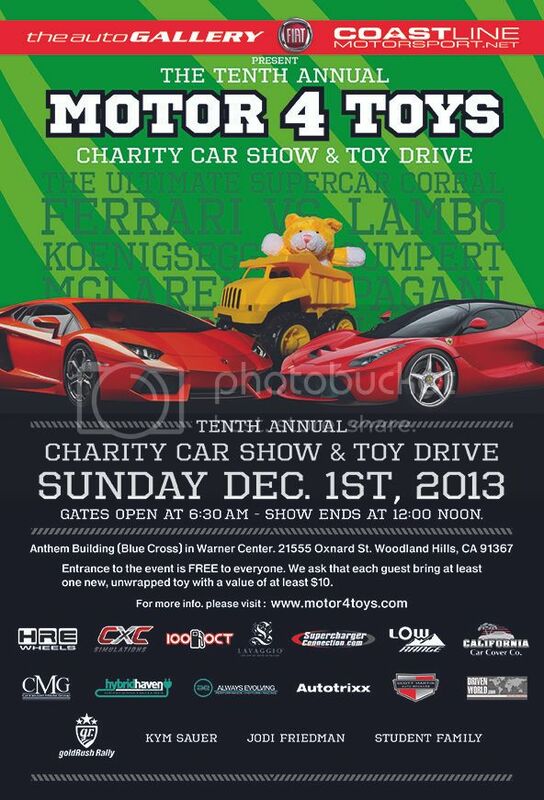 If you cannot attend the show with toys, please consider donating online. It was suggested by one of own in the car community, Rick Zundel to set up a Gofundme Charity page. Our goal is $15,000.00. Rick got the ball rolling by very kindly donating $500.00. Hey, if you can donate one dollar, we will gladly take it...a million dollars, hey we will take that too...all proceeds will go to buy toys for the kids! In less than 24 hours, we are already at $1100.00....can you help us!!!!!! and more...add your name here!